Irish Luck Serves Keleen Owner Well!!! I drive myself crazy as a “do it now” guy who never puts anything off, but for some reason unknown to me, I let seeking a new representative for San Diego/Orange County stay on my “back burner” for a number of months. Then, with no real intention of putting this off, I got around to the issue in early February truly by accident. Then all of a sudden Irish Luck comes into play. I got a referral to Becky Walker and Associates based in San Diego, also covering Orange County California. Momma Mia!!! I now come to find that Becky Walker has an amazing leather background, having sold leathers for about twenty years with Keleen’s two largest competitors, and days before my contact Becky had separated from our biggest competitor!!! Let’s add to the story that oddly the temperatures in Chicago were hitting all-time lows while San Diego was at its normal range of right about 76 degrees!!! So a perfect time for me to trot off to San Diego early on a bitterly cold Sunday morning to arrive in CA mid-morning to blinding bright sunshine at an incredible Oceanside resort hotel. Well, someone has to see to this need for Keleen Leathers, right? I thoroughly enjoyed this Sunday afternoon then Monday I was so delighted to be introduced to three very charismatic women at a gorgeous designer showroom in Del Mar, California. I then spent two days filled with enthusiastic excitement shared by all of us about this new association. All four of us felt as though this is one of those unexpected turns in life of a “marriage made in heaven”. Keleen Leathers, Inc. is truly thrilled and very proud to have Becky Walker and Associates as part of the Keleen Leathers sales network. Then, “Icing on The Cake”!! Becky suggested to me that I should take the train going on up to Los Angeles to meet Matthew Caracappa, Keleen’s Los Angeles representative. What an unexpected amazing adventure. So incredibly beautiful is this slightly over two hour panoramic experience of one of America’s most beautiful vistas; ocean, mountains, agriculture, forestry. I have now told many to get this trip on their life’s “bucket list” of things to do while still on this earth. So, my “Irish Luck” has provided both a great new representative group and a very fun experience, not to mention the 76 degree weather while Chicago shivers with wind chills well below zero!!! 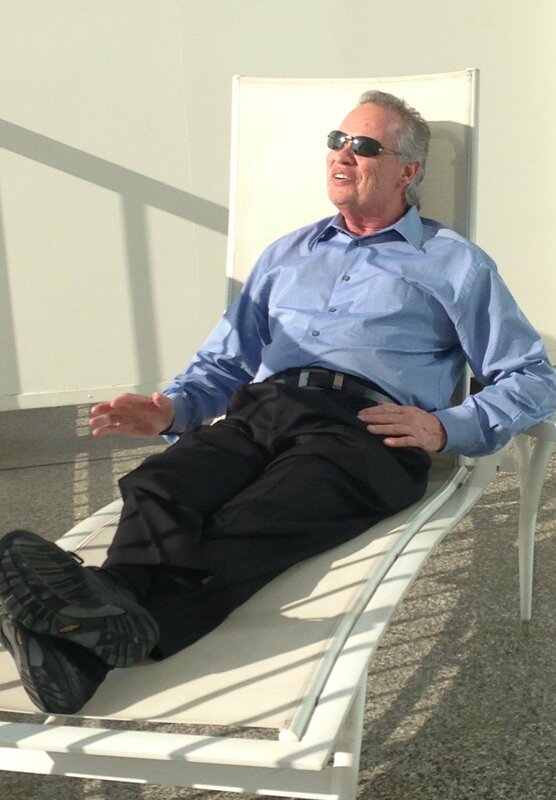 ( Pic here of me in the lounge chair in the sun)??? This entry was posted in The Owner's Journal on February 24, 2015 by Veronica.